"This project will allow Russia to mitigate future risks of losing share in the Turkish energy market. Turkey is actually surrounded by a number of countries rich in natural gas, like Iran and Iraq. Even though these countries have great potential for natural gas production," they haven't developed it yet, the expert said. Volkan Emre pointed to transit risks as the most important factor contributing to Moscow's decision to promote the Turkish Stream pipeline. "The project will also allow Moscow to mitigate transit risks involved in Russia's imports to the European Union. Basically, by building this pipeline Russia will be able to cut transit route dependence on Ukraine, Moldova, Romania and Bulgaria," the analyst explained. "This pipeline is going to give very significant flexibility to Russia to export its natural gas at minimal costs directly to Europe." The new pipeline also offers major advantages to Ankara. The project will help Turkey satisfy increasing demand for electricity production at home. Beyond Tomatoes: What Will Improved Bilateral Ties Mean for Russia and Turkey? "This is very significant because around 40-45 percent of electricity generation in Turkey comes from natural gas," the analyst said. "I don't think that will change anytime soon." The Turkish Stream project was unveiled in late 2014 as an alternative to the South Stream pipeline, but talks were suspended in November 2015 after the Turkish Air Force shot down a Russian bomber in Syria. 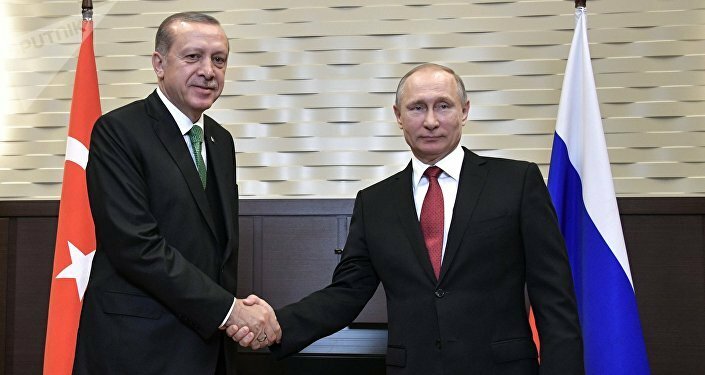 The initiative was given the green light after Moscow and Ankara mended bilateral ties following Turkey's apology to Russia last June. In October 2016, the two countries signed an intergovernmental agreement on the construction of two offshore sections of the Turkish Stream gas pipeline. The annual capacity of each stretch is estimated to have a capacity of 15.75 billion cubic meters of natural gas. Last week, Russian energy giant Gazprom announced that the company had started building the first section of the pipeline. Gazprom pledged to provide its clients in Turkey and Europe with "a new reliable route for the import of Russian gas" by the end of 2019. The construction started four days after the summit between Russian President Vladimir Putin and his Turkish counterpart Recep Tayyip Erdogan. The implementation of the Turkish Stream project was one of the key issues on the agenda of the meeting, which took place in Sochi on May 3.